This book has gotten a lot of attention (including being a finalist for the National Book Award) and, now that I’ve finally read it, I see why. It’s a fairly substantial novel yet I read it in a day–it is one of those books that inspires that kind of dedicated binge reading with its story, which sets up several lines of narrative tension. It was also a pretty easy read, sort of pop-y and weirdly fun for the (post-apocalyptic / mass-death) subject matter. 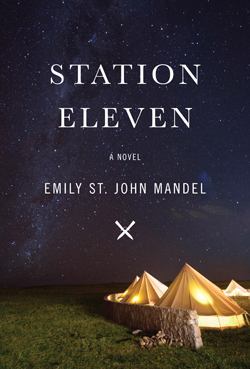 Station Eleven kicks off in our world, in a theater, at a production of King Lear through the eyes of a paramedic in training named Jeevan. By the end of the chapter, there is a shockingly direct revelation that the book is not at all what it has seemed up until that point. From there on, the narration jumps between characters and time periods, following a pandemic that kills most of earth’s population and causes the collapse of civilization, sometimes stretching back decades before that opening scene, sometimes filing in parts of the intervening years. We see Jeevan at various points in the future, and while I would have liked to spend even more time with him throughout the book, I thought he was a really interesting choice as a lens for the beginning of the end. The main characters are all connected, in some way, to that King Lear performance. This was both neat and slightly undermining of a mystery in the book. The true identity of a nefarious character, known as the Prophet, is unknown to the book’s characters and maybe also is supposed to be to the reader, but, I found it almost immediately obvious, which made the information’s slow revelation a bit tedious. A plot point that had, for me, the opposite problem was one involving the childhood friend of a central character, a famous actor, who published an unauthorized collection of letters he sent her. I felt like, and still feel like, I missed something important in terms of why this whole thread is in the book. The last aspect of the book I felt a bit unconvinced by was the emphasis on a set of sci-fi graphic novels, created by one character and treasured by two others. I liked the device of the books except for their content, which spoke too directly to the post-civiliization circumstances of the book. Their plot had almost no resonance with the broader story because the parallel was so clear that there was no use even thinking about it. The use of science fiction as a device overall, though, was more successful. While I’m not a big Star Trek fan myself, I grew up with a lot of Star Trek because of my parents and brother, so I got a kick out of the many Trek-related quotes and allusions. A mantra in the book, “Survival is insufficient,” comes from Star Trek (not even the old Star Trek!) and is pretty compelling, I thought. Despite the handful of misgivings I described above, I definitely recommend this book. It is an absorbing and entertaining read, with clear, strong writing.